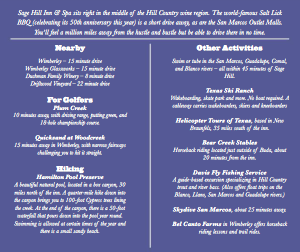 Texas Lifestyle Magazine Goes Wild for Sage Hill Inn & Spa! Travel writer Marika Flatt recently visited Sage Hill Inn & Spa, capturing the essence of her visit in this wonderful feature, pages 62-63 in Texas Lifestyle Magazine. She also provides a great guide for nearby attractions and other activities. Thanks so much Marika! We hope you come visit us again soon!